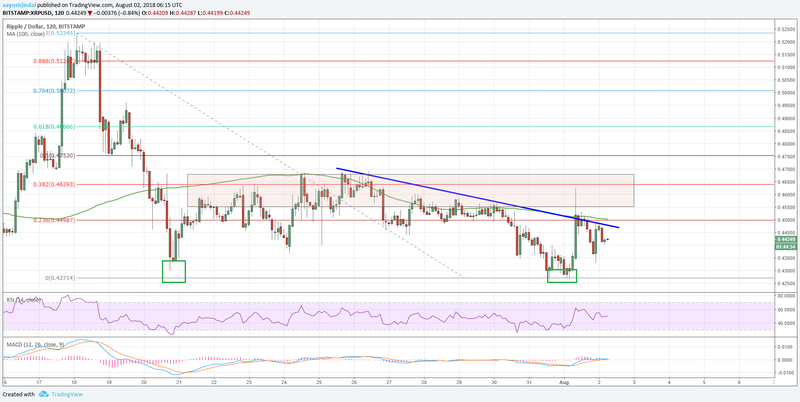 Ripple price retested the $0.4250-0.4300 support area and bounced back against the US Dollar. XRP/USD must clear $0.4550-0.4660 resistance zone for more gains. Ripple price is facing a tough resistance near the $0.4550 and $0.4660 resistances against the US Dollar. There is a short-term bearish trend line formed with resistance at $0.4460 on the 2-hours chart of the XRP/USD pair (Data feed via Bitstamp). The pair has to remain above the $0.4250 and $0.4300 support levels to break to the upside. There was a slow and steady decline recently in Ripple price below the $0.4550 level against the US Dollar. The XRP/USD pair tested a major support area near $0.4250-0.4300 and bounced back. Looking at the chart, the price traded above the $0.4550 resistance level and spiked above the 23.6% Fib retracement level of the last slide from the $0.5235 swing high to $0.4271 low. However, the price faced a solid resistance near the $0.4660 level. Moreover, the price failed to settle above the $0.4550 barrier and the 100 simple moving average (2-hours). More importantly, there was no complete test of the 38.2% Fib retracement level of the last slide from the $0.5235 swing high to $0.4271 low. The price declined and moved back below the $0.4550 level. It seems like there is a short-term bearish trend line formed with resistance at $0.4460 on the 2-hours chart of the XRP/USD pair. Above the trend line, the 100 hourly SMA is positioned at $0.4550. Therefore, there are many barriers formed for buyers near the $0.4550 level, trend line, and the 100 hourly SMA. Above $0.4550, the price has to move above the $0.4660 resistance to gain bullish momentum. Above this last, ripple price will most likely move higher towards the $0.4800 and $0.5000 levels. On the downside, the recent low of $0.4271 is a crucial support. XRP/USD must hold above $0.4250 to start a decent recovery in the near term. If not, it may decline towards the $0.4000 support.